Massimo mentioned how the nightshades are related to controlling ones instincts. The drugs were used in the old times to allow someone to release their inhibitions - to be out of control. In patients requiring nightshades, you often find this conflict. In children who are less compensated, the wildness comes out more readily. But with adults you often see someone who is more controlled, more suppressed as this patient was. This patient talks repeatedly of keeping his anger and rage under control. The nightshades are also well known for congestion, which he mentioned regarding his pounding headaches. His sensitivity to light and sound during the headaches also helps to confirm the nightshades. 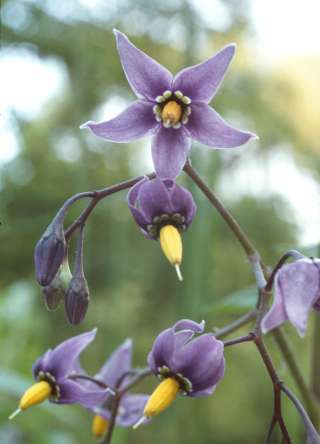 Nightshades (the poisonous ones such as Bell, Stram, etc.) are parasympatholytics. They are neurological toxins that suppress the parasympathetic nervous system. This leaves the sympathetic nervous system unrestrained – the fight or flight response is thus intensified. This leads to a type of “wildness”, a lack of inhibition. This is why you’ll see some nightshades who are somewhat shameless in presentation. Often we are told to consider Stram, Bell, or Hyos in children who are violent and out of control. 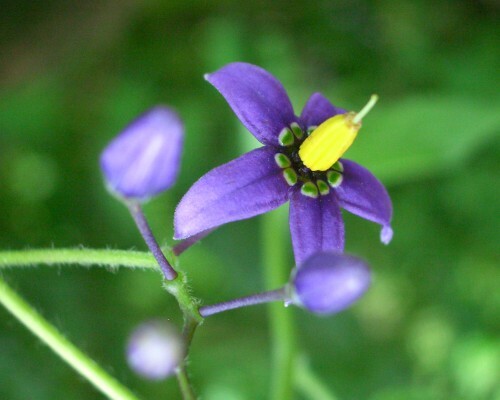 However, nightshades in adults often present as over controlled. They may have a very violent history, but often learn to suppress or even over-control their reactions. They can become emotionally somewhat cold for this reason – this is true in particular of Belladonna. So they present with nervous tics, impulse control issues, rages, etc. This is indicative of their system’s attempt at keeping things under control. Adult Nightshade patients can also often get stuck in their head, in their intellect, to avoid emotions. This is seen in this patient (see this issue: Stramonium, a case of PTSD) as he talks about always trying to wonder why this happened, or brooding on the past always with trying to find an answer. They can also avoid emotions via this physical restlessness as he describes. These are used as strategies to avoid experiencing feelings directly. In this case too, you can see the split between the “dark-side” or the unconscious and the conscious side. He often refers to having lost one side of himself, or the repeating dream of darkness on one side and light on the other. The voice calling him to the dark side. This again shows the common conflict seen in nightshades with this split, or lack of integration. Of course the toxic nightshades are also narcotics. But their use in the old times was different from the sacred psychedelics of the old times. Peyote, Ayahuasca, and Psilocybin have been traditionally used to alter consciousness and then come back with a lesson, something learned for our conscious side. Yet the toxic nightshades were often used before battle, to help one do their killing without remorse. Then when the drug wore off, they couldn’t recall their violence. This helps to understand why these different broad classes of narcotics have different applications in homeopathy. Patients needing the sacred narcotics are often struggling with being too open to the universe, struggling between feeling too blended with the larger world, or feeling totally isolated. The nightshades are certainly can also be oversensitive to the world around them. Yet the emphasis is more on struggling with trying to keep their “dark-side” under control. Nightshades are useful for patients with difficulty integrating their “dark-side” with their daily life. It appears that their dark side is their feelings or needs they had to suppress in the past for fear of being forsaken. I’ve been studying with Massimo Mangialavori since 1998. He talks about studying materia medica via cured cases. This has become a growing and profound reality for me. Of course learning from the provings and repertory are always important. However, I was never able to read materia medica and understand the Rx and how it might apply to a patient. But once one has seen a cured case, whether someone else’s or one’s own, that is the beginning of understanding a Rx. By extension, this also helps to learn the family of the Rx. Another fundamental teaching is that of learning to see the greater themes or trends in a patient rather than just symptoms. He also talks a lot about understanding Rx’s and people by looking at the underlying strategy of the patient – how they are getting their needs met as constrained by their pathology. These lessons have particularly helped with autistic patients, unwilling teens, and some delusional patients. Often these patients won’t give us some of the deeper symptoms we prefer. Using themes, and patient strategies has helped to solve some very difficult cases where the patient was unable or unwilling to disclose deeper details. As examples, I currently have two autistic boys who were unable to speak. One case is doing wonderful on Lac Felinum, the other on Coca. I also have a paranoid delusional patient who was adamantly claiming she had no problems or complaints– physical or mental. She was brought in by her daughter, who in a separate interview revealed some very intractable paranoid delusions. That patient is doing wonderful on Thea. The above cases were solved using the larger themes and strategies of the patients rather than looking for symptoms that were simply not available. Using Massimo’s specific theory of families was also fundamental to solving these cases as well as many others. Massimo also uses a lot of contemporary psychology to elucidate a more contemporary understanding of the psyche. Besides teaching with his long term cures, he also shows his deeper understanding of the patient and the Rx from many different angles. This has helped me to truly understand Rx’s, instead of just seeing a Rx as a list of symptoms. It is hard to use words to convey how profoundly this teaching has impacted the accuracy and ease now common in my practice. In the beginning as a student, one needs to borrow other good prescribers knowledge by studying their long term cured cases. But as I’ve seen good cures of many families of Rx, rare as well as common Rx’s, it has completely altered my perception. It is common now for me to give a Rx that works well and deeply right from the initial intake, doing all the repertorization and differential during the initial intake (mine are 2 hours or less). As my working body of knowledge has expanded I’ve seen more and more cures with a full range of Rx’s. I mostly credit this to Massimo’s grounded clinical knowledge as well as my own growing database of long term cured cases. Massimo’s teaching is about learning how to fish for oneself. It has helped me to grow and express my love of homeopathy via beautiful and growing success with my patients.